Before watching Captain America: Civil War, we sat down for a late-afternoon and mostly empty screening of Batman v Superman: Dawn of Justice. The reasons for this were to not only start making comparisons in favour of Marvel’s own major superhero team-up movie, but also to see just how DC was attempting to run their own enterprise of comic-book movies. We still stand by our opinion that, while it’s definitely not a very good movie, it has more things to enjoy about it than its predecessor Man of Steel (namely Affleck as Batman, Gal Gadot as Wonder Woman, and a few others), but even still it is an absolute mess of a film, trying to cram in so much material in order to set up future DC movies, take inspiration from other popular Batman and Superman stories, reinvent iconic characters to little satisfying effect (Jesse Eisenberg’s Lex Luthor-Joker hybrid in particular), AND be its own story that ultimately doesn’t add up. Put simply, Batman v Superman was undeniably DC’s attempt to do everything that Marvel has spent almost a decade building up towards in one single movie, and because of that it was an overall failure – not a complete disaster, but a failure nonetheless. Having now seen Civil War, the third in the Captain America standalone trilogy that started with The First Avenger and continued with The Winter Soldier, we can firmly say that if anyone can do exactly what Marvel can do and still somehow make it work, it’s Marvel. 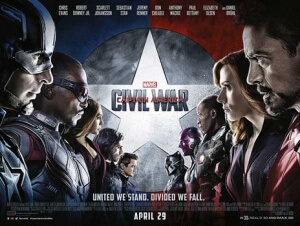 To say that Civil War puts Batman v Superman to shame by doing pretty much the same thing they did but on a much more successful level is a major understatement; it takes the idea of superheroes being pitted against one another in a full-on battle to bigger and more mature heights, challenging the viewer more than any other Marvel movie to date with complex themes and arguments that are weighted just evenly enough for us to understand and sympathise with both sides, but never allowing the fun and excitement to be buried underneath all the diplomacy. This could well be Marvel at its peak; it will be fascinating to see if any forthcoming film in their current “Phase 3” line-up can rival Civil War in almost all areas, from script work to direction to action to scope, and so on. The plot, based very loosely on the popular comic storyline written by Mark Millar, sees Steve Rogers/Captain America (Chris Evans) and his new team of Avengers – Black Widow (Scarlett Johansson), War Machine (Don Cheadle), Vision (Paul Bettany), Falcon (Anthony Mackie) and Scarlet Witch (Elizabeth Olsen) – being faced with a new government body designed to monitor and police all superhero activity, after an opening mission in Lagos, Nigeria unexpectedly ends in tragedy. Rogers and a handful of Avengers disagree with these new regulations, while others – led by Tony Stark/Iron Man (Robert Downey Jr.) – are strongly in favour of being put in check, and as a series of international incidents lead to the resurgence of the Winter Soldier, a brainwashed assassin previously known as Steve’s closest friend Bucky Barnes (Sebastian Stan), things soon escalate into an all-out confrontation between the former allies – all while a mysterious figure known as Zemo (Daniel Brühl) operates covertly with his own agenda against the quarrelling Avengers. What’s so great about this film is that each side of this argument, about whether government supervision is a good thing or not, is entirely understandable and fleshed out as best as they can be so that it’s not just black-and-white. You completely understand why Captain America would be hesitant about interference from higher powers, especially after the trust issues he went through in The Winter Soldier, and why Stark would campaign heavily for it, particularly after the destructive consequences in Avengers: Age of Ultron as well as an early confrontation in this film from a grieving mother (Alfre Woodard) whose son died in the climactic battle. Even Zemo’s motivations, as villainous as they undoubtedly are, you quickly identify as something that would come from a person like this, which probably makes him one of the most interesting villains that Marvel has introduced in these films outside of Loki, because they’re not just all-out evil but not completely saintly either. So, when the eventual clash of titans does come around, you completely understand why they’re fighting and what sets them apart, through clever writing and smart direction from Anthony and Joe Russo that places the focus on exactly where it needs to be, and even when it does switch itself around from scene to scene, from character to character, it is never clumsy or wildly uneven; it all feels just right. It’s exactly where Batman v Superman went wrong, as the weight of their fight was based on something that made far less sense, and their similar brooding personalities never made it a truly compelling battle; Civil War, on the other hand, could not be more opposite to that. Although there is definitely a lot going on in this film, and at 147 minutes – the longest Marvel movie to date – it can be very slightly challenging to sit patiently through, it still manages to entertain without once bogging itself down in all the seriousness. There’s still a lot of humour (albeit very scattered), exciting action – a showdown at an abandoned airport in particular is, erm, a marvel – and a great cast of characters who by this point most of us should be familiar with and enjoy watching thanks to their fun and likable personalities. Although it is definitely a Captain America film in terms of its structure and central focus, this can also be seen as a strong ensemble movie where everyone gets to contribute something to the overall narrative and be incredibly entertaining while doing so, and while everyone does an expectedly good job, it’s two certain newcomers that leave the biggest impact. Chadwick Boseman, as the vengeful Prince of fictional African country Wakanda T’Challa (better known as Black Panther), is a respectable and compelling presence, commanding every scene he’s in with grace and majesty, in a performance that leaves you wanting a whole lot more from this character. More significantly, however, is the re-introduction of Peter Parker/Spider-Man into the Marvel Cinematic Universe after last year’s rights deal between Sony and Marvel Studios, and with all due respect to past incarnations Tobey Maguire and Andrew Garfield, Tom Holland in just a handful of scenes in a film that’s not even his own has completely taken ownership of the character, perfectly balancing the boyish naivety of Parker and the playful nature of his web-slinging alter-ego that probably makes him the closest any movie has come thus far to representing the comic-book character that everyone loves. Any scene involving him, including his participation in that airport sequence and an unexpected meeting with Stark in the apartment he shares with Aunt May (Marisa Tomei, who will never not be an absolute beauty in our eyes), leaves you with an overwhelming sense of joy, not least because you’re finally seeing Spider-Man interact with other established Avengers after years of wishing for it. Based on the limited amount of time he is on-screen, we are eagerly anxious to see where Holland takes the character next in his own solo outing next year (don’t let us down, writers of Vacation). It will be tough, however, for either that film, or Black Panther’s film, or any other film that Marvel currently has lined up to truly topple Captain America: Civil War as the most engaging, most entertaining, and most complete superhero movie to come out for some time. Same with everything that DC has lined up, but given how great this film is, and how not great they’re doing right now, that would seem all but impossible. Captain America: Civil War is the greatest accomplishment of the Marvel Cinematic Universe to date, handling complex themes and multiple characters in a narrative that challenges the viewer as well as entertain the living hell out of them, but never once feeling as bogged down or as clunky as other projects – *ahem*Batman v Superman*ahem* – which this leaves well and truly in the lurch.